President Trump’s election success rested to a considerable degree on his pre-election attack on globalization and verbal pledge to bring manufacturing jobs back to the United States. However, as I argued in a previous post, there is no reason to believe that President Trump is serious about wanting to restrict corporate mobility or fashion new, more domestically-centered, worker-friendly trade relations. In fact, several of his appointees to key economic policy positions are people whose past work was promoting the very globalization he criticized. Still, there are some in the labor and progressive communities who continue to hold out hope that they can find common ground with the Trump administration on trade. Unfortunately, it appears that these people are ignoring what we do know about the nature of existing manufacturing jobs in the globalized industries that President Trump claims he will target for restructuring. Sadly, the experience of workers in many of those jobs reveals the hollowness of Trump’s promises to working people. Political and market pressure on Japanese and European (and later, Korean) manufacturers to reduce imports to the United States has led to a rising number of “transplants” supplying auto components and assembling autos. Initially, the transplants operated in the Midwest, including assembly plants in Illinois (Mitsubishi), Michigan (Mazda), Ohio (Honda), and Pennsylvania (Volkswagen), along with California (Toyota’s joint venture with General Motors, now a Tesla facility). More recently, however, the growth has been in Southern states, including assembly plants in Alabama (Honda, Hyundai, and Mercedes-Benz), Georgia (Kia), Kentucky (Toyota), Mississippi (Nissan and Toyota), South Carolina (BMW and Mercedes-Benz), Tennessee (Nissan and Volkswagen), and Texas (Toyota). As a result of these trends, the weight of motor vehicle manufacturing employment (including parts suppliers) in the United States has shifted from the Midwest to the South. And what kind of jobs has this investment brought? The title of a Bloomberg Businessweek article – Inside Alabama’s Auto Jobs Boom: Cheap Wages, Little Training, Crushed Limbs – sums it up all too well. In 2014, OSHA’s Atlanta office, after detecting a high number of safety violations at the region’s parts suppliers, launched a crackdown. The agency cited one year, 2010, when workers in Alabama parts plants had a 50 percent higher rate of illness and injury than the U.S. auto parts industry as a whole. That gap has narrowed, but the incidence of traumatic injuries in Alabama’s auto parts plants remains 9 percent higher than in Michigan’s and 8 percent higher than in Ohio’s. In 2015 the chances of losing a finger or limb in an Alabama parts factory was double the amputation risk nationally for the industry, 65 percent higher than in Michigan and 33 percent above the rate in Ohio. He stood there for an hour, his flesh burning inside the heated press. Someone brought a fan to cool him off. . . . When emergency crews finally freed him, his left hand was “flat like a pancake,” Allen says, and parts of three fingers were gone. His right hand was severed at the wrist, attached to his arm by a piece of skin. A paramedic cradled the gloved hand at Allen’s side all the way to the hospital. Surgeons removed it that morning and amputated the rest of his right forearm to avert gangrene several weeks later. And what happened to the company? They received a $103,000 fine from an Occupational Safety and Health Review Commission. The Businessweek article includes several other stories of workers maimed because of unsafe work conditions at firms with long histories of safety violations. 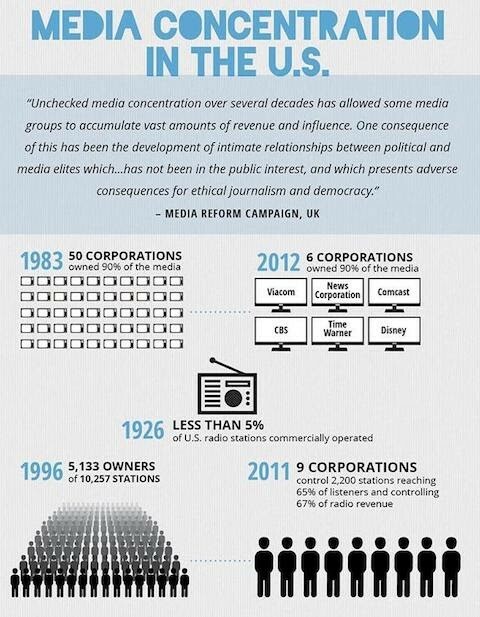 And they all ended in much the same way: with corporations paying minimal fines. And, apparently with little change in corporate behavior. We know that most employers will push production as hard as they can to cut costs, with little regard for worker safety. We also know that union jobs are better than non-union jobs in terms of wages and benefits, and safety. We also know that President Trump is taking steps to weaken labor laws and unions, as well as gut federal and state agencies charged with protecting worker health and safety and the environment. Thus, even if President Trump does succeed in enticing some globalized corporations to shift parts of their respective production networks back to the US, the experience of the auto industry demonstrates that the resulting job creation is unlikely to satisfy worker demands for safe, living wage jobs. In sum, no matter the campaign rhetoric, and no matter the twists and turns in policy, it should be clear to all that President Trump is committed to an anti-worker agenda. 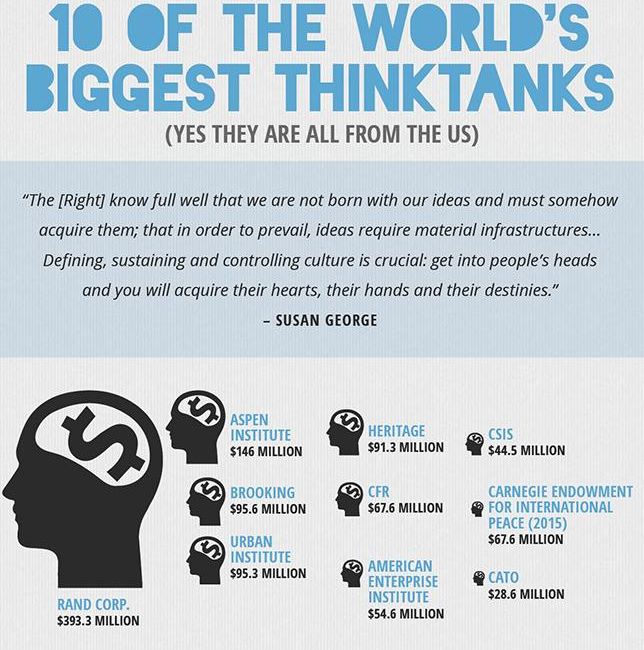 See the complete infographic to learn more about the leading media, thinktanks, and corporations that seek to shape our thinking. 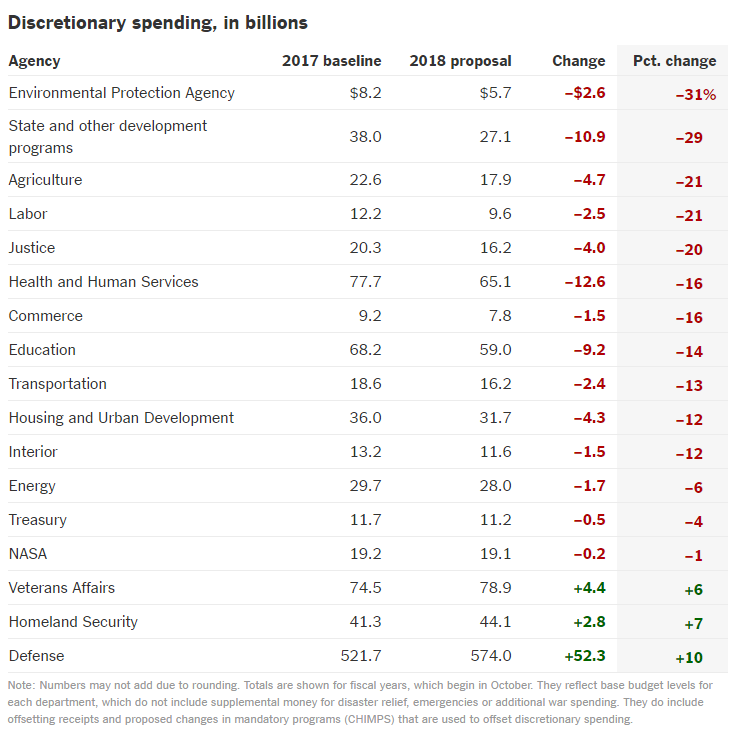 President Trump released what is called a “skinny budget.” It may contain far less information then the skinny budgets released by the five previous administrations, but its aim is crystal clear: more money for militarism, less money for pretty much everything else. The Trump budget includes only estimates for fiscal 2018 and only for its proposed changes to discretionary programs (those funded through the annual appropriations process) — even though discretionary programs make up less than one-third of the federal budget. The Trump budget omits any figures on entitlement or mandatory spending (e.g., Social Security, Medicare, Medicaid, federal retirement, or SNAP), interest payments, revenues, or deficits. The following table shows the Trump administration’s proposed changes in discretionary program spending for fiscal year 2018 (which begins in October 2017). 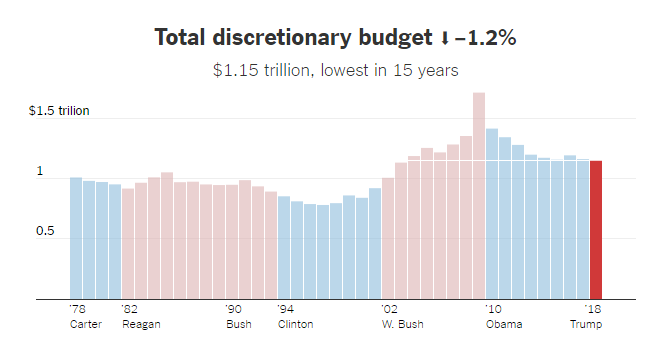 The budget calls for a continuation of Obama administration cuts in overall discretionary spending—a 1.2 percent decline in real dollars for fiscal year 2018. The figure below highlights the trend. Through legislation like the Clean Air Act and the Clean Water Act, the EPA has ensured that Americans live in a relatively healthy environment. Thanks to the EPA’s work, from 1970 to 2015, national emissions of pollutants like lead, carbon monoxide, and nitrogen dioxide have declined by an average of 70 percent. These and more changes meant 160,000 people in the US didn’t die prematurely due to air pollution in 2010 alone. Since the 1980s, the EPA has also worked with local authorities to clean up some of the most polluted sites in the US, from landfills that caught fire to radioactive waste housed close to residential areas. oversees several major agencies, including the Food and Drug Administration, the National Institutes of Health, the Centers for Disease Control and Prevention, the Substance Abuse and Mental Health Services Administration, and the Office for Civil Rights. . . .These agencies make sure our drugs are safe, provide funding for medical research, lead the way during public health outbreaks such as the ebola scare, and provide services to those struggling with drug addiction. . . .Half of the most transformative drugs of the last 25 years were made possible because of publicly funded research, according to a 2015 study. The proposed budget for the Education Department would be its lowest in 17 years. The discretionary part of the Department of Agriculture budget would be slashed to its lowest level since the 1970s. Transportation would have its lowest real budget in 18 years. Labor’s budget would be rolled back to levels last seen in the 1970s. None of this matters, of course, to those powerful political and economic forces that are determined to push the militarization of the country. Whether this skinny budget turns out to be a trial balloon, a way for the Trump administration to gauge how far it can go, followed by modest adjustments if it meets strong resistance, remains to be seen. Regardless, it is critical that we begin now to engage in serious coalition building involving those communities that rely on public services and the public sector workers, at all levels of government, that deliver those services, to shape and advance a powerful and positive vision of the public sector we want and need. Otherwise, we face a future of ever worsening tradeoffs, with profit-driven corporations steadily moving into the vacuum created by cuts in public programs to increase their control over all facets of our lives. Those who advocate “freeing the market” claim that doing so will encourage competition and thereby increase majority well-being. These advocates have certainly had their way shaping economic policies. And the results? According to several leading economists, the results include the growing monopolization of product markets and steady decline in labor’s share of national income. Neither outcome desirable. The authors calculated sales concentration in six large sectors—manufacturing, retail trade, wholesale trade, services, finance, and utilities and transportation—for the years 1982 to 2012. They used two different measures of sales concentration: the fraction of sales in an “average industry” accounted for by its four largest firms (CR4 with Sales) and by its twenty largest firms (CR20 with Sales). The results are illustrated in the figure below. There is a remarkably consistent upward trend in concentration in each sector. In manufacturing, the sales concentration ratio among the top 4 increases from 38% to 43%; in finance, it rises from 24% to 35%; in services from 11% to 15%; in utilities from 29% to 37%; in retail trade from 15% to 30% and in wholesale trade from 22% to 28%. Over the same period, there were similar or larger increases in CR20 for sales. The authors explain this growth in concentration by the rise of so-called “superstar” firms. These firms are characterized by rapid productivity growth and their dominance comes from the ways in which technological change has made most markets “winner take most.” In other words, innovative firms are able to quickly assert market dominance thanks to “the diffusion of new competitive platforms (e.g. easier price/quality comparisons on the Internet), the proliferation of information-intensive goods that have high fixed and low-marginal costs (e.g., software platforms and online services), or increasing competition due to the rising international integration of product markets.” And thanks to first mover advantages, this success builds upon itself, allowing superstar firms to further strengthening their market position. Whatever the reason, clearly “market competition” has strengthened monopoly power, especially in manufacturing, finance, utilities, and retail trade, all sectors where the top four firms now account for at least 30 percent of average industry sales. It is the rise of these superstar firms, according to the authors, that best explains the decline in labor’s share of national income. They test and reject several other explanations. For example, some economists argue that international trade is key. But the authors point out that it is not just import-competing industries in which labor’s share is falling; it is also falling in non-traded sectors like retail trade, wholesale trade, and utilities. All of this points to the growth of superstar firms as the key to explaining labor’s declining share of national income. According to the authors, superstar firms have a lower labor share than do most other firms. One reason is that these firms tend to enjoy significant markup pricing power which allows them to boost their profits without adding labor. Another is that they also tend to enjoy great economies of scale; with a relatively fixed amount of overhead labor, they are able to boost production without a commensurate increase in employment. Again, we observe a rising concentration in all six sectors for 1982 to 2012, although employment concentration has grown notably more slowly than sales concentration in finance, services, and especially in manufacturing. The pattern suggests that firms may attain large market shares with a relatively small workforce, as exemplified by Facebook and Google. And as these firms increase their market dominance, labor’s overall share tends to fall. As the authors explain: “those industries where concentration rises the most have the sharpest falls in the labor share . . . [Thus] the fall in the labor share is mainly due to a reallocation of labor towards firms with lower (and declining) labor shares, rather than due to declining labor shares within most firms.” In fact, the strength of this negative relationship between market concentration and labor’s share grew stronger over the period of study. These results are important, suggesting that capitalism’s motion itself is driving labor’s declining share. However, I think that there is good reason to believe that the underlying dynamics at work are different from those highlighted above. To state it bluntly, superstar firms are driving down labor’s share because they are increasingly using strategies of profit maximization that have them replace direct labor with contract labor, franchising, and supply chains. Over most of the post-war period, until the late 1970s, large corporations tended to directly employ the workers needed to produce the goods or services they sold. But starting in the 1980s, and especially in the 2000s, these firms began actively shedding employees and hiring smaller firms to carry out the tasks that were once done in-house. This enabled these lead corporations to greatly expand production and boost profits with a minimal increase in direct employment. A maid works at the San Francisco Marriott on Fisherman’s Wharf. The hotel property is owned by Host Hotels and Resorts Inc., a lodging real estate company. The maid, however, is evaluated and supervised daily and her hours and payroll managed by Crestline Hotels and Resorts Inc., a national third- party hotel management company. Yet she follows daily procedures (and risks losing her job for failure to accomplish them) regarding cleaning, room set- up, overall pace, and quality standards established by Marriott, whose name the property bears. A member of a loading dock crew working in Southern California is paid by Premier Warehousing Ventures LLC (PWV)— a company providing temporary workers to other businesses— based on the total time it takes him and members of his crew to load a truck. PWV, in turn, is compensated for the number of trucks loaded by Schneider Logistics, a national logistics and trucking company that manages distribution centers for Walmart. Walmart sets the price, time requirements, and performance standards that are followed by Schneider. Schneider, in turn, structures its contracts with PWV and other labor brokers it uses to provide workers based on those prices and standards and its own profit objectives. At one time, large corporations like Marriott, Time Warner, and Walmart directly employed the workers that labored on their behalf. But no more. Now, these large corporations are able to escape paying many of those who “work for them” the wages and benefits offered to their other employees. Instead, their salaries are paid by other smaller firms, whether they be independent businesses, temporary work agencies, or franchise owners, or in more extreme cases so-called independent contractors. And because these second-tier businesses operate in highly competitive markets, with substantially lower profit margins than the lead corporations they service, these workers now receive far lower salaries with few if any benefits and protections. This [business strategy] creates downward pressure on wages and benefits, murkiness about who bears responsibility for work conditions, and increased likelihood that basic labor standards will be violated. In many cases, fissuring leads simultaneously to a rise in profitability for the lead companies who operate at the top of industries and increasingly precarious working conditions for workers at lower levels. Never before have American companies tried so hard to employ so few people. The outsourcing wave that moved apparel-making jobs to China and call-center operations to India is now just as likely to happen inside companies across the U.S. and in almost every industry. . . . The contractor model is so prevalent that Google parent Alphabet Inc., ranked by Fortune magazine as the best place to work for seven of the past 10 years, has roughly equal numbers of outsourced workers and full-time employees, according to people familiar with the matter. About 70,000 TVCs—an abbreviation for temps, vendors and contractors—test drive Google’s self-driving cars, review legal documents, make products easier and better to use, manage marketing and data projects, and do many other jobs. They wear red badges at work, while regular Alphabet employees wear white ones. . . .
Companies, which disclose few details about their outside workers, are rapidly increasing the numbers and types of jobs seen as ripe for contracting. At large firms, 20% to 50% of the total workforce often is outsourced, according to staffing executives. Bank of America Corp. ,Verizon Communications Inc., Procter & Gamble Co. and FedEx Corp. have thousands of contractors each. . . .
Janitorial work and cafeteria services disappeared from most company payrolls long ago. A similar shift is under way for higher-paying, white-collar jobs such as research scientist, recruiter, operations manager and loan underwriter. They found that the percentage of US workers with alternative work arrangements rose from 10.1 percent [of all employed workers] in February 2005 to 15.8 percent in late 2015. (See the figure below). Looking behind the curtain shows that the decline in labor’s share is the result of a brutal process of work restructuring that affects a rapidly growing percentage of US workers. Reversing the decline will require both a broader awareness of the negative social consequences of the private pursuit of profit and a far stronger labor movement than we have today.